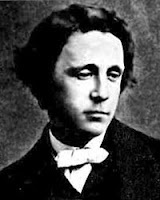 Lewis Carroll was the Reverend Charles Lutwidge Dodgson, an Anglican clergyman, and author of Alice in Wonderland. As a Christian he was deeply troubled by the doctrine of hell and eternal punishment, unable to reconcile such an idea with the supposed goodness of his God. The real solution would have been to recognize the contradiction and abandon the Bible as the word of god, adopting in its place Deism, Philosophical Theism, or atheism. Unable to give up Christianity completely, he attempted to interpret scripture as saying hell was not eternal. Throughout the history of the church, in fact, a minority has always tried to find a way around the monstrous evil of everlasting fire, Universalism and Annihilationism being two minority positions. Of course, most orthodox Christians reject such attempts to transform their god into a being approaching the level of human mercy and compassion, prefering the old fire and brimstone, perverting their normal sense of justice and right and wrong to go along with what they've been taught is God's truth. David J. Stewart of Jesus-Is-Savior.com, for example, believes that almost everyone goes to hell. Rev. Dodgson knew in his heart there is something terribly wrong with that belief. As he says in this essay: "When all this has been considered, its outcome seems to me to be the irresistible intuition that infinite punishment for finite sin would be unjust, and therefore wrong. We feel that even weak and erring Man would shrink from such an act. And we cannot conceive of God as acting on a lower standard of right and wrong. In the words of Dean Church, " Can we be so compassionate and so just, and cannot we trust Him to be so?" To set aside this intuition, and to accept, as a just and righteous act, the infliction on human beings of infinite punishment for finite sin, is virtually the abandonment of Conscience as a guide in questions of Right and Wrong, and the embarking, without compass or rudder, on a boundless ocean of perplexity. In taking this position, we have to face such questions as these : " Why do I accept whatever God does as being right, though my conscience declares it to be wrong ? Is it that He is my Maker? What ground have I for holding that the power of creating is a guarantee for goodness ? Or is it that He loves me ? But I know already that wicked beings can love. No. The only reasonable ground for accepting what He does as being right seems to be the assurance that He is perfectly good. And how can I be assured of this, if I put aside as useless the only guide that I profess for distinguishing between right and wrong, the voice of Conscience ? " The most common form of the difficulty, felt in regard to this doctrine, may be thus expressed : " I believe that God is perfectly good. Yet I seem compelled to believe that He will inflict Eternal Punishment on certain human beings, in circumstances which would make it, according to the voice of my conscience, unjust, and therefore wrong." This difficulty, when stated in logical form, will be found to arise from the existence of three incompatible Propositions, each of which has, apparently, a strong claim for our assent. They are as follows : I. God is perfectly good. II. To inflict Eternal Punishment on certain human beings, and in certain circumstances, would be wrong. III. God is capable of acting thus. One mode of escape from this difficulty is, no doubt, to let the whole subject alone. But to many such a position is a cause of distress ; they feel that one of these three Propositions must be false ; and yet to regard any one of them as false plunges them into difficulties and bewilderment. The first thing to be done is to settle, as clearly as possible, what we mean by each of these Propositions, and then to settle, if possible, which two of the three rest, in our minds, on the deepest and firmest foundations, and thus to discover which one, of the three, must perforce be abandoned. First, then, let us settle, as clearly as possible, what we mean by each of these Propositions. I. God is perfectly good. As to the meaning of this word "good," I assume that the Reader accepts, as an Axiom antecedent to any of these three Propositions, the Proposition that the ideas of Right and Wrong rest on eternal and self-existent principles, and not on the arbitrary will of any being whatever. I assume that he accepts the Proposition that God wills a thing because it is right and not that a thing is right because God wills it. Any Reader, of whom these assumptions are not true, can feel no difficulty in abandoning Proposition II., and saying, " If God inflicts it, it will be right." He, therefore, is not one of those for whom I am now writing. I assume, then, that this Proposition means that God always acts in accordance with the eternal principle of Right, and that He is, therefore, perfectly good. II. To inflict " Eternal Punishment" on certain human beings and in certain circumstances, would be wrong. The word " Punishment " I assume to mean, here, " suffering inflicted on a human being who has sinned, and because he has sinned." I use the word " suffering," rather than " pain," because the latter word is so often understood as implying physical pain only, whereas mental pain might also serve as punishment. Hence we may at once simplify this inquiry by excluding from our consideration, the case of suffering inflicted where the sin of the creature is not a necessary cause. Taking " sin " to mean (as already defined) a " conscious and voluntary " act, so that, if the act be involuntary , it ceases to be sin, we may set aside the Calvinistic theory, which contemplates the infliction of suffering on creatures unable to abstain from sin, and whose sins are therefore involuntary. This theory will be considered elsewhere. The word " Eternal" I assume to mean "without end." As to the human beings who are here contemplated as the subjects of Eternal Punishment, there are three conceivable cases, viz. : (A) The case of one who has ceased to possess Free- Will, and who therefore has no further power either to sin or to repent. In such a case, Eternal Punishment would be suffering inflicted through infinite time, and therefore itself infinite in amount as punishment for sins committed during a finite time. (B) The case of one who retains Free-Will, and who has ceased to sin, has repented of all past sins, and is choosing good as good. In this case also Eternal Punishment would be infinite suffering, inflicted as punishment for sins committed during a finite time. (C) The case of one who does not come under either of these descriptions, that is, one who retains Free-Will and continues for ever to choose evil. In such a case Eternal Punishment would be infinite suffering, inflicted as punishment for infinite sin. I assume that the reader would not feel any difficulty in recognising the justice of inflicting continuous suffering as punishment for continuous sin. Hence we may set aside case (C) altogether. Also we may combine cases (A) and (B) into one, and interpret Proposition II. as asserting that it would be wrong to inflict infinite suffering, on human beings who have ceased to sin, as punishment for sins committed during a finite time. Proposition III. does not seem to need any explanation. It will be well before going further to re-state the three incompatible Propositions, in order to give to Proposition II. the form it has now assumed. I. God is perfectly good. II. To inflict infinite suffering on human beings who have ceased to sin, as punishment for sins committed during a finite time, would be wrong. God is capable of acting thus. We know with absolute certainty that one at least of these three Propositions is untrue. Hence, however overwhelming may be the weight of evidence with which each seems to claim our assent, we know that one at least may reasonably be abandoned. Let us now take them, one by one, and consider, for each in turn, what are the grounds on which it claims our assent, and what would be the logical consequences of abandoning it. It may be that the Reader will then be able to see for himself which two of the three have the strongest claims on his assent, and which he must, therefore, abandon. First, then, let us consider the Proposition. I. " God is perfectly good." The grounds on which this claims our assent, seem to be, first, certain intuitions (for which, of course, no proofs can be offered), such as " I believe that I have Free-Will, and am capable of choosing right or wrong ; that I am responsible for my conduct; that I am not the outcome of blind material forces, but the creature of a being who has given me Free- Will and the sense of right and wrong, and to whom I am responsible, and who is therefore perfectly good. And this being I call ' God.' " And these intuitions are confirmed for us in a thousand ways by all the facts of revelation, by the facts of our own spiritual history, by the answers we have had to our prayers, by the irresistible conviction that this being whom we call " God " loves us, with a love so wonderful, so beautiful, so immeasurable, so wholly undeserved, so unaccountable on any ground save His own perfect goodness, that we can but abase ourselves to the dust before Him, and dimly hope that we may be able some day to love Him with a love more like His great love for us. The abandonment of this Proposition would mean practically, for most of us, the abandonment of the belief in a God, and the acceptance of Atheism. Secondly, let us consider the Proposition. II. To inflict infinite suffering, on human beings who have ceased to sin, as punishment for sins committed during a finite time, would be wrong. Here it will greatly simplify our inquiry to begin by considering what are the various purposes for which punishment may be supposed to be, first, enacted, and secondly, inflicted ; and what are the principles which, in view of those purposes, would make us regard its enactment and infliction as right or wrong. Punishment, when enacted or inflicted, by human beings upon each other is necessarily limited in its purposes. We cannot read the minds of others, and therefore can never know whether any human being is or is not really guilty in anything he does. Consequently, human punishment can never reach beyond the outward act : we dare not attempt to punish thoughts, however sinful, that have not resulted in action. And, even here, our principal purpose must necessarily be to save Society from the injury that such acts would cause to it. Hence there is little in the principles affecting punishment, when inflicted by Man, that we can safely appeal to in considering punishment as inflicted by God. There is, however, one principle which clearly applies equally to both : we recognise that some proportion should be observed, between the amount of crime and the amount of punishment inflicted : for instance, we should have no hesitation in condemning as unjust the conduct of a judge who, in sentencing two criminals, had awarded the greater punishment to the one whose crime was clearly the lesser of the two. But, in the sight of God, our guilt consists in the sinful choice, and we rightly hold that two men, who had resolved, in similar circumstances, on committing the same crime, would be equally guilty in His sight, even though only one had actually committed the crime, while the other had been accidentally prevented from carrying out his intention. Hence we may assume that God's purpose, in the enactment of punishment, is the prevention of the sinful choice, with all the evils consequent upon it. When once the punishment has been enacted, it must necessarily, unless some change takes place in the circumstances contemplated in the enactment, be inflicted. We may easily imagine a man, who has enacted some punishment, finding good reasons for not inflicting it ; for instance, he might find that he had made a mistake in enacting it, or that he had failed to take account of some unforeseen circumstance. We might even imagine a man to have threatened a punishment without any intention of ever inflicting it. But none of these suppositions can be made as to punishment enacted by God. We cannot believe Him to be ignorant of any of the circumstances, or capable of announcing that He will do what He does not really intend to do. We must trust His perfect knowledge of the thoughts of men, for judging who is guilty and who is not, and the only principle of right and wrong that seems reasonably applicable, is the sense that some proportion should be observed between the amount of sin and the amount of the punishment awarded to it. And here comes in the one consideration which, as I believe, causes all the difficulty and distress felt on this subject. We feel intuitively that sins committed by a human being during a finite period must necessarily be finite in amount ; while punishment continued during an infinite period must necessarily be infinite in amount. And we feel that such a proportion is unjust. Once suppose the punishment finite for finite sin, so that if at any period of time the sinful choice ceased to exist, the punishment would not be infinite, and I believe this difficulty would no longer be felt, and that we should be ready to recognise punishment as deserved, and therefore as justly inflicted ; and also to recognise the many good purposes, such as the reformation of the sinner, or the warning given to others, which the punishment might serve. There is another intuition, felt, I believe, by most of us, of which no account has yet been taken. It is that there is some eternal necessity, wholly beyond our comprehension, that sin must result in suffering. This principle is, I believe, enshrouded in, and may to some extent make more credible to us, the unfathomable mystery of the Atonement. And this principle must be allowed for, I think, in considering the present subject. There is also a difficulty, that will probably occur to some readers, which ought to be noticed here. It is the doubt whether the man who checks and puts out of his mind a sinful wish merely from fear of punishment, can really be less guilty in the sight of God, "Granted," it may be urged, " that Divine punishment is incurred by the evil wish, whether or no it result in evil act, so that its enactment may serve to prevent that wish, yet surely what God requires is that we should love good as good, and hate evil as evil. If a man checks the evil wish merely from fear of punishment, and not because it is an evil wish, does he thereby cease to sin?" Here it must be admitted, I think, that the enactment of punishment for evil wishes does not, of itself, produce the love of good as good, and the hatred of evil as evil. Yet surely it may help in that direction ? God uses, I believe, such motives as best suit the present need ; at one time, perhaps, fear may be the only one that will influence the sinner ; later on, when, through fear, some habit of self-restraint has been formed, the evil wish may be checked by the consideration that indulgence of it might lead to acts which the man is beginning dimly to recognise as evil ; later still, when this recognition has grown clearer, a higher motive (such as human love) may be appealed to ; and later still, the love of good as good, and the love of God as the Being whose essence is goodness. When all this has been considered, its outcome seems to me to be the irresistible intuition that infinite punishment for finite sin would be unjust, and therefore wrong. We feel that even weak and erring Man would shrink from such an act. And we cannot conceive of God as acting on a lower standard of right and wrong. In the words of Dean Church, " Can we be so compassionate and so just, and cannot we trust Him to be so?" To set aside this intuition, and to accept, as a just and righteous act, the infliction on human beings of infinite punishment for finite sin, is virtually the abandonment of Conscience as a guide in questions of Right and Wrong, and the embarking, without compass or rudder, on a boundless ocean of perplexity. In taking this position, we have to face such questions as these : " Why do I accept whatever God does as being right, though my conscience declares it to be wrong ? Is it that He is my Maker? What ground have I for holding that the power of creating is a guarantee for goodness ? Or is it that He loves me ? But I know already that wicked beings can love. No. The only reasonable ground for accepting what He does as being right seems to be the assurance that He is perfectly good. And how can I be assured of this, if I put aside as useless the only guide that I profess for distinguishing between right and wrong, the voice of Conscience ? " Such are the difficulties that meet us, if we propose to take the second possible course, and to reject Proposition II. The third possible course is to accept Propositions I. and II., and to reject III. We should thus take the following position. " I believe that God will not act thus. Yet I also believe that, whatever He has declared He will do, He will do. Hence I believe that He has not declared that He will act thus." The difficulties, entailed by choosing this third course, may be well exhibited in another set of incompatible Propositions, as follows : 1. God has not declared that He will act thus. 2. All that the Bible tells us, as to the relations between God and man, are true. 3. The Bible tells us that God has declared that He will act thus. As these three Propositions cannot possibly be all of them true, the acceptance of (i) necessarily entails the rejection of either (2) or (3). If we reject (2), we are at once involved in all the perplexities that surround the question of Biblical Inspiration. The theory of Plenary Inspiration which asserts that every statement in the Bible is absolute and infallibly true has been largely modified in these days, and most Christians are now, I think, content to admit the existence of a human element in the Bible, and the possibility of human error in such of its statements as do not involve the relations between God and Man. But, as to those statements, there appears to be a general belief that the Bible has been providentially protected from error : in fact, on any other theory, it would be hard to say what value there would be in the Bible or for what purpose it could have been written. The more likely course would seem to be to reject (3). Let us consider what difficulties this would entail. We are now supposed to have taken up the following position : " I do not bejieve that the Bible tells us that God has declared He will inflict Eternal Punishment on human beings, who are either incapable of sinning, or who, being capable of sinning, have ceased to sin." It is well to remind the Reader that, in taking up this position, he entirely escapes from the original difficulty on account of which we entered on this discussion. And how widely different this is from what we considered as the first of the courses possible to us ! That would have involved us in the abandonment of Christianity itself; this entails many difficulties, no doubt : but they all belong to the infinitely less important field of Biblical Criticism. The Reader who is unable, whether from want of time or from want of the necessary learning, to investigate this question for himself, must perforce accept the judgment of others : and all he needs here to be told is that the interpretation of the passages, which are believed to teach the doctrine of " Eternal Punishment," depends largely, if not entirely, on the meaning given to one single word (cuwy). This is rendered, in our English Bibles, by the word " eternal " or " everlasting " : but there are many critics who believe that it does not necessarily mean "endless." If this be so, then the punishment, which we are considering, is finite punishment for finite sin, and the original difficulty no longer exists. In conclusion, I will put together in one view the various modes of escape, from the original difficulty, which may be adopted without violating the inexorable laws of logical reasoning. They are as follows : (1) "I believe that the infliction, on human beings, of endless punishment, for sins committed during a finite time, would be unjust, and therefore wrong. Yet I cannot resist the evidence that God has declared His intention of acting thus. Consequently I hold Him to be capable of sinning." This would practically mean the abandonment of Christianity. (2) "I believe that God is perfectly good, and therefore that such infliction of punishment would be right, though my conscience declares it to be wrong." This would practically mean the abandonment of conscience as a guide to distinguish right from wrong, and would leave the phrase " I believe that God is perfectly good " without any intelligible meaning. (3) " I believe that God is perfectly good. Also I believe that such infliction of punishment would be wrong. Consequently I believe that God is not capable of acting thus. I find that the Bible tells us that He is capable of acting thus. Consequently I believe that what the Bible tells us of the relations between God and Man cannot be relied on as true." This would practically mean the abandonment of the Bible as a trustworthy book. (4) " I believe that God is perfectly good. Also I believe that such infliction of punishment would be wrong. Consequently I believe that God is not capable of acting thus. I find that the Bible, in the English Version, seems to tell us that He is capable of acting thus. Yet I believe that it is a book inspired by God, and protected by Him from error in what it tells us of the relations between God and Man, and therefore that what it says, according to the real meaning of the words, may be relied on as true. Consequently I hold that the word, rendered in English as ' eternal ' or ' everlasting,' has been mistranslated, and that the Bible does not really assert more than that God will inflict suffering, of unknown duration but not necessarily eternal, punishment for sin." Any one of these four views may be held, without violating the laws of logical reasoning. Here ends my present task; since my object has been, throughout, not to indicate one course rather than another, but to help the Reader to see clearly what the possible courses are, and what he is virtually accepting, or denying, in choosing any one of them. What Is This Recurring Charge On My Statement? Do Food Additives Make Kids Hyper? Video: John McCain Says "10,000 Years In Iraq"
Judiciary Committee Chairman Nadler Wants Mueller to Testify by May 23 - Bring it. Andrea Dworkin on Bill, Hillary, and Monica Lewinsky...back in 1998 - Following some links from friends on Twitter, I came upon this old essay, which has, indeed, aged well, and is scathing and funny at he same time. This Habit Is A Sign That Your Tech Addiction Is Worse Than You Think - Here's how to know when it's time to make a change.